When I was little, my mom had a ‘dust mop’, you know – an antique version of the Swiffer – which she used on the kitchen floor almost daily. 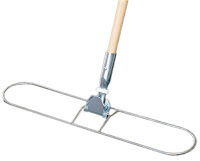 I never knew how ahead of the times she was until I learned more about how important this tool is in helping keep floors of shops, garages, and commercial factories clean and debris free. You’re thinking right now that the broom you are using works just fine, but the next time you use your broom to clean the floor, notice these three things: how it just pushes the dirt around, how it can sometimes leave little lines of dirt behind, and how it creates a cloud of dust. The advantage of using a commercial dust mop is that it attracts and collects dirt. That’s because we apply a light static oil, which not only helps collect the dirt, but it also helps the mop glide gracefully across the floor. I have to confess that I saw one of these things in action, and I was jealous. We have hardwood floors throughout our house, and I have two messy man-boys that live here with me. I cannot begin to tell you how many Swiffer dust cloths I go through in a week. While the Swiffer is a clever invention, the mop itself doesn’t pivot or keep you from stopping and stooping to go under and around things like A Cleaner World’s mop does. Let me also add that I broke the handle on the Swiffer and am too sorry to buy a new one, so I have to hunch over every time I use it. The length is the perfect size for a child, not a grown woman. But if you break the handle on your commercial dust mop, A Cleaner World will just bring you a new one. 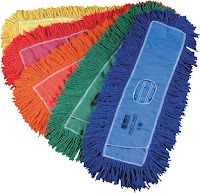 The mops themselves are colorful (which is important in my book especially if you color-code areas of your business), come in a variety of sizes, are easy to swap out, and here’s the best part – A Cleaner World cleans them for you. Having a clean floor not only helps your business look nice, it is important from a safety standpoint. If your floors need some TLC and you are in Greensboro, High Point, or Winston-Salem, give Scottie Springer a call at 336-870-6299. He’ll come to you, help you determine what your need, and get you set up a schedule that best fits you and your business. Most folks that own a business typically purchase their wet mops at a box store. It makes sense really, as long as you don’t know what I’m about to share with you. 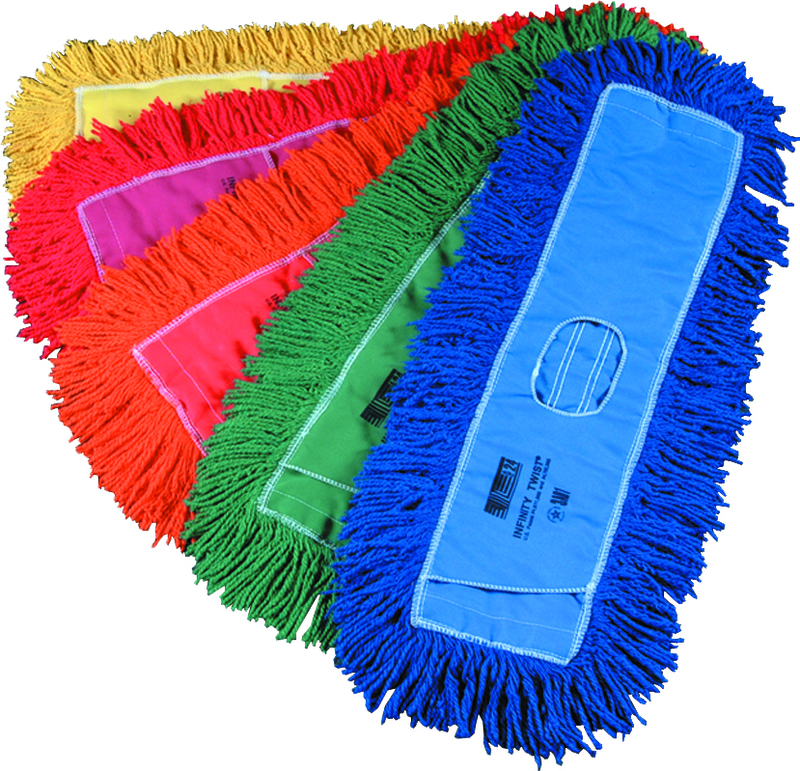 Most personally-owned wet mops are made of either microfiber or cotton. Why does that matter? If a microfiber mop gets grease on it, it simply becomes ineffective. In essence, it will just push dirt around on your floors. Cotton mops leave lint behind. Plus cotton is incredibly absorbent, so it retains moisture which leads to mildew, mold, and ewww -- creature growth. In time, both mops will develop an odor that will transfer to the floor eventually causing your business to have a sour smell. What about taking off the mop head and washing it? You could but do you really want to put that thing in your home washing machine? Besides, home washing machines and regular detergent won’t get all the dirt and grime off the mop head. 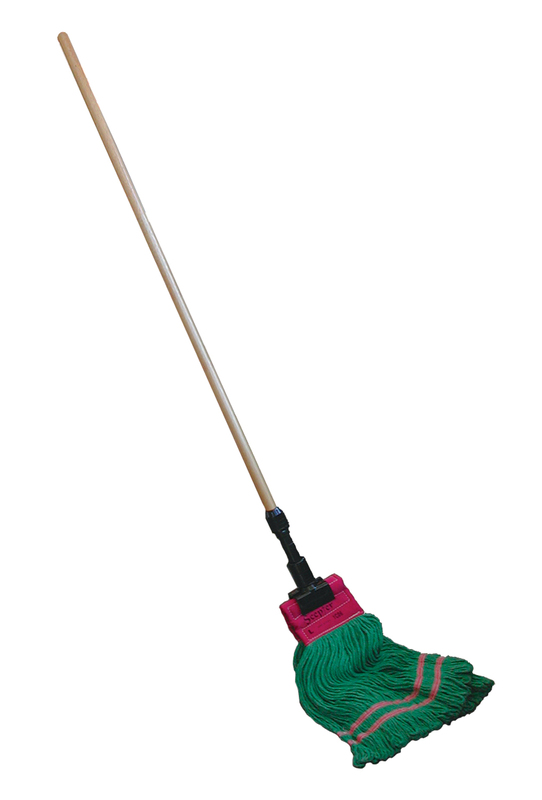 The mops from A Cleaner World Commercial Services are made from highly twisted cotton/polyester fibers. While they are absorbent, they also have the ability during the wringing process to give up almost all moisture. Best of all, Derrick, our Route Service Representative extraordinaire, will stop by on whatever schedule you prefer to take your soiled mop and replace it with a fresh/clean mop. He will bring the soiled mop back to our warehouse facility where we will wash it in a commercial grade washing machine with a specially designed detergent that will remove anything you can get on a mop. You have so many details to keep up with as you run your business. The last thing you want to worry about is whether your facility smells bad or if the environment is safe. 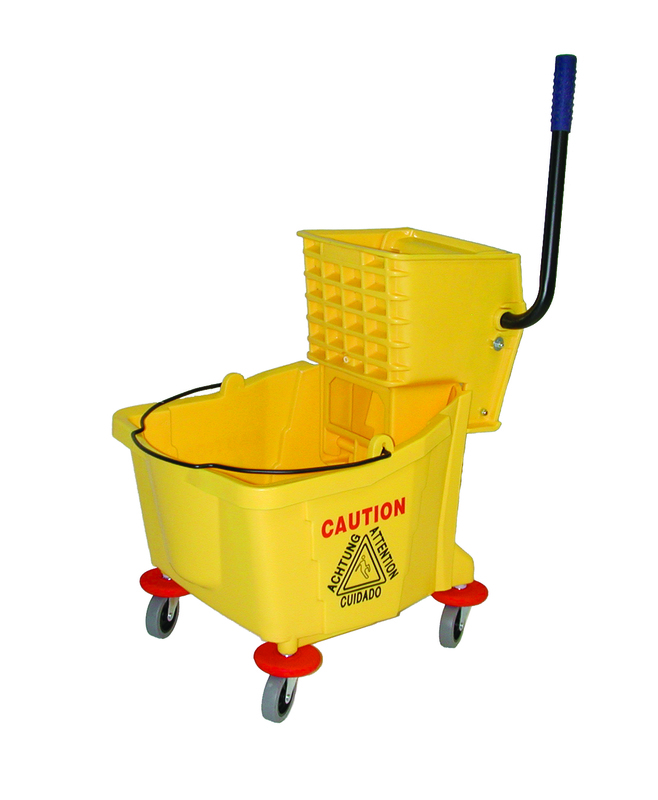 A Cleaner World offers a wide variety of commercial mops in the Triad area, and we are certain that we have one that will fit your needs perfectly. Just call Scottie Springer 336-870-6299, and he is always glad to help. I am messy, and I hate to be dirty. That’s a terrible combination, especially if I’m eating out at a restaurant. If I dribble, drop, or spill something, I have an overwhelming desire to do something – right then. I know I shouldn’t. In fact, Mike Taylor once said these exact words to me: “I would never encourage anyone to do their own spotting unless it is an extreme circumstance and you need to do it to save the night.” Realistically, I cannot think of a circumstance where I would need to address a dribble to save the night. It’s just that I simply can’t help myself. So if you are like me and cannot keep yourself from addressing a dribble while dining out, or better yet, if you have a mishap and are about to present earth-shattering information to a crowd of 10,000 onlookers, I’ve compiled a list of do’s and don’ts. Know the fabric of your garment; this is helpful for a number of reasons. Water-based stains will stand a better chance of coming out of synthetic fibers. If your garment is silk, then definitely leave the spill alone; anything you use on silk to try and remove the spill will likely leave a ring. If you carry a stain remover pen with you, know that these many times work safely on washable garments, but they shouldn’t be used on dry clean-only garments or certain fabrics. Never, ever rub a spill. Gently blot the area with a dry, clean white cloth or napkin; if you use a cloth or napkin with color or print, the color could transfer to the garment. Rubbing can easily remove garment dye on certain fabrics, like how dark denim jeans get faded and eventually turn white on the knees. Finally, rubbing will cause the ingredients to go deeper into the fabric, which will make the stain spread and more difficult to remove. If you are determined to do more than just blot the stain right then, you can use a technique known as ‘flexing’. This involves pinching the fabric with each hand on either side of the stained area. Once pinched, make a rolling motion back and forth, keeping the right hand slightly ahead of the left. This rolling action pushes stains up and out of the fabric rather than driving them in deeper. In certain instances, club soda can be used sparingly on spills, but there’s always a but with using it. First, never use it on an oily spill from things like French fries and salad dressing because it can cause the spill to spread and sometimes cause the dye to bleed. Oily stains are best removed via the dry cleaning process. Second, the chances of removal are greatly increased if applied before the stain dries. Third, there are some stains that club soda can make worse. For instance, if club soda is used to remove a water and solvent combination stain, like ballpoint ink, it can actually set the stain permanently. Finally, if you do use club soda to address a stain during an emergency, be sure to have it professionally cleaned as soon as possible after your event. Point out both the original stain and the club soda when dropping off the garment. Last week we shared a couple of tips on how to recover from the holidays. One suggestion we made was to consider donating unneeded items to The Salvation Army. For several years now, A Cleaner World has been a drop off site for anyone that wants to donate their gently-used clothes, toys, household goods, and even furniture to The Salvation Army Family Thrift Stores. We’ve dubbed the project “Donate Goods, Do Good”, because items like these that are donated to The Salvation Army are sold to the community, many times at bargain prices, and the proceeds help support their programs like disaster relief, adult rehabilitation, youth camps, elderly services, and so on. We tend to hear terms like programs a lot, but I think it helps to learn about the people that are impacted. Recently I spoke with Ellen Bliven of the Greensboro Salvation Army, and she shared so many stories of how the donations touch person after person. For instance, a few months ago a gentleman came into their store. He just needed a pair of shoes; the ones he had on were literally falling off of his feet. Then there are the transient folks that merely need a change of clothes and a few toiletries, and the families that cannot afford to clothe their children. These folks receive vouchers so that they can come in and shop and get what they need. I could continue on, but I know you get the idea. These donations aren’t for programs, they are for people – our neighbors in need. The bottom line is that 100% of the proceeds from The Salvation Army Family Thrift Stores go back into the community. “Anybody can help,” stated Major Vick from the Greensboro Salvation Army. “Everyone has something in their closet that can help someone.” It’s true. I know I have a pair of shoes I could donate, and think of the difference that one pair of shoes could make in someone’s life.